It is no secret that I’ve been a huge supporter of Hard Case Crime and their truly marvelous line of new and classic noire crime thrillers. So imagine my utter surprise when I learned they were going to be presenting, in their usually garish pulp packaging, a Sherlock Holmes book. The idea seemed completely insane and I thought it was a mere marketing ploy to cash in on the release of the new movie blockbuster currently in theaters starring Robert Downey Jr. as Holmes and Jude Law as Dr.Watson. Well, believe it or not, gimmick or not, this bizarre little suspense thriller actually fits Hard Case Crime’s line-up. It is a pulp crime tale from start to finish and one in which the Great Detective ends up playing a secondary role by the book’s end. That it is told in two halves is also unique and Doyle is clearly aping the early pop-boilers which were often focused on evil secret organizations. In this case, they are an American coal mining union whose brotherhood has taken to using criminal means to gain the power they desire. Into their midst comes a new “member” eager to rise in the brotherhood. As the group plots one act of brutal terrorism after another against any and all that would oppose them, the character’s descent into a living hell becomes intense and incredibly suspenseful. Whereas all this so called back-story comes in the book’s second half, long after Sherlock Holmes has already solved a particularly ingenious murder. How the two halves are reconciled and the grim denouement at the end make this one of Doyle’s bleakest tales. One I might never have bothered to read had it not been for this very original packaging. We tip our fedora to Charles Ardai’s and a very cool idea. The joy of pulps is how some are so hard to categorize, case in point this terrific novel set in an alternate 1950s. It’s part detective story, Hitchcock chase thriller and all out pulp adventure all rolled into one. Noel Glass is a disgraced scientist whose experiments with microwaves went horribly awry and killed six of his colleagues, including the woman he loved. Disgraced and banished from the scientific community, Glass, fifteen years later, is self-employed in Chicago as a private detective; a rather unique gumshoe in that he uses his genius intellect to help the police with difficult cases. Keeping in mind the setting is the 50s before forensic sciences were even known, let alone available. Glass is very much the science-detective to his small number of associates. When a wealthy industrialist approaches him and reveals that tragedy that ruined his life was no accident, but a manipulated murder, Glass is propelled into the most important case of his career. In the process he becomes framed for murder and branded a spy and traitor. Suddenly he’s being hunted by the C.I.A., the F.B.I. and the Army as one of the most dangerous men in country. The only positive note in the entire affair is the fact that he not alone in his dilemma. Accompanying him as he races across the South West attempting to evade the authorities, are a Japanese entrepreneur with extraordinary martial arts skill named Wan Lee and a gorilla of gunman named Vincent. Before their journey is reaches its conclusion, these three will deal with Russian sleeper agents, the assignation of Joseph Stalin and the many tentacles of a super secret organization bent on destroying the world so as to rebuild it into some technocratic utopia. Oh, and there’s also a beautiful femme fatale songstress somehow involved with it all. Talk about throwing in the kitchen sink, this book has it all and then some. The writing is brisk, peppered throughout with colorful slang true to the era. It’s pacing is very Saturday matinee cliff-hanger, as Glass is forever falling into one dangerous situation after another and having to extricate himself any way he can, either with sheer brute strength or his exemplary mental prowess. All the while trying to solve the riddle of his past. This is one of the most enjoyable books I’ve read this year and David Boop is a writer you need to put on your radar. He’s fresh, original and laces his work with a spirit of zany, madcap fun that is truly infectious. 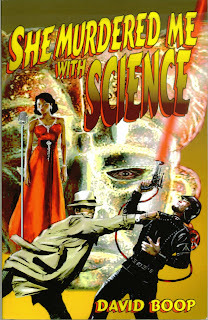 Be good to yourself this Christmas season and pick up a copy of SHE MURDERED ME WITH SCIENCE. You can thank me later. Quick little note here, as we've recently been approached by several authors on this matter. Sadly, we do not review e-books. Bottom line is we spend way too much time in front of this monitor as is with our own writing and editing projects. When we read novels, both for our enjoyment and then these reviews, we want the old fashion joy of sitting back in a nice easy chair and having a real book in our hands. We don't think that's too much to ask. So, with no disrespect intended here, if your book is only available to read on-line, we're going to pass on it. Thanks, and a Happy Holiday to all of you out there in book-land.